Some friends gave me some of this Eden Foods Hot Pepper Sesame Oil a while back. They eat it on practically everything, pizza, etc. I'm not quite so serious about it, but my bottle is running on empty, and I started looking for some more. I haven't found it in my grocery store, but I did find it available on Amazon (see link above). Then, I was browsing Pinterest and found this recipe for Hot Chili Oil. So, of course, I had to try it. Pour oil into small pan or sauce pot. Heat on low heat for a few minutes to warm. Crush the dried peppers as finely as you would like. All that matters is that the peppers are broken open so that the spicy membranes on the inside are exposed to the oil. Add the crushed chiles to the heated oil. Cook, stirring occasionally, for about 10 minutes. Do not let the heat get too high. 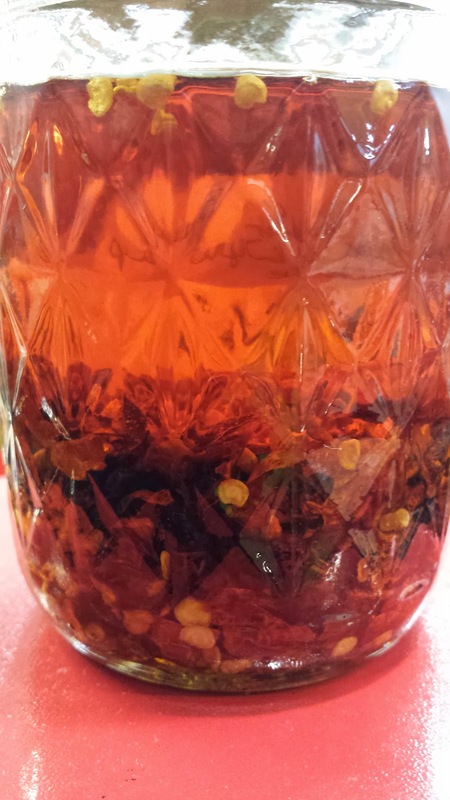 You want to infuse the oil with the chili peppers, not fry the peppers. After 10 minutes, remove pan from heat and allow oil to cool before pouring into a jar or container. 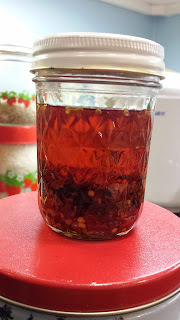 This makes enough chili oil to keep in a small jar. This was really easy to make, and the oil is really good. I used my Ninja to chop the chili peppers, and that seemed to work really well. Remember to wash your hands thoroughly after handling the chili peppers - or wear gloves. Dried peppers can be just as painful as the fresh ones if you touch your eyes (or nose) afterwards! So far I've used it to pop some chili spiced popcorn and drizzled it on my Beef Noodle Bowl. 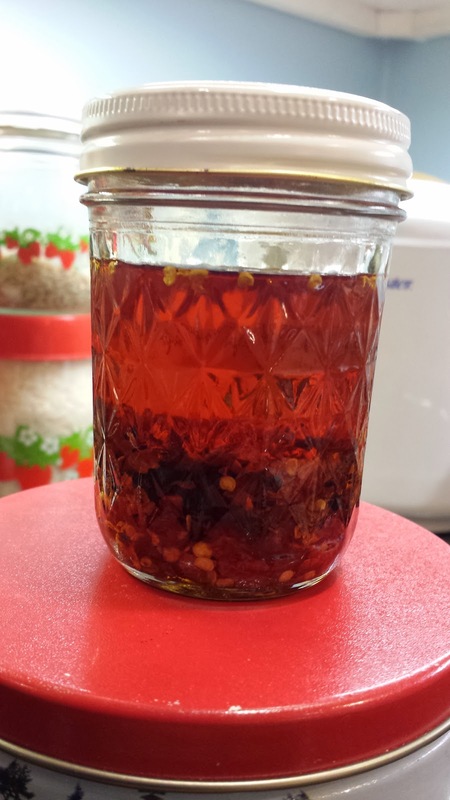 Now that I'm no longer running low on my chili oil, and I know how easy it is to replenish it, I am going to have to start using it on everything. I know there are a lot more uses for it than I've tried. Yet. 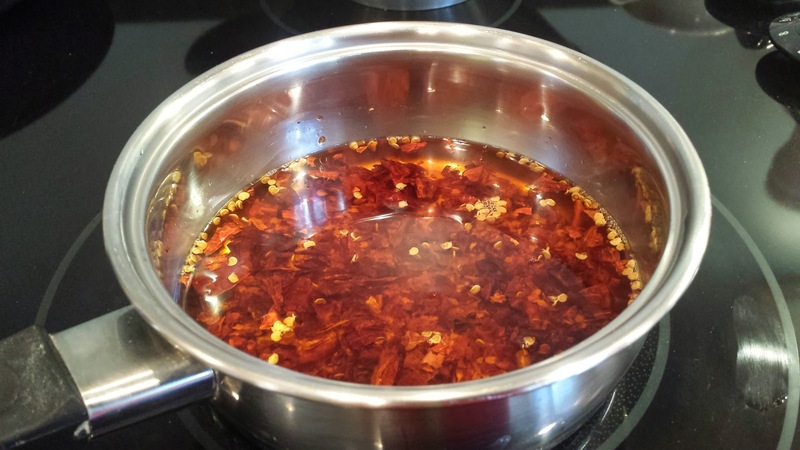 Do you use Hot Chili Oil? What do you like to use it for? I'd love to hear some great ideas. It's time again for Secret Recipe Club (Secret Recipe Club) reveal! Unfortunately I had to sit out this month because we were out of town for a couple weeks, and with preparing to leave, being gone, getting back, etc. etc., I just didn't feel I had the time. But, I know there will be lots of amazing recipes shared by my group - the Awesome Group A - so I am posting the blog hop here, because nobody wants to miss out on a great recipe, right? Tune in next month when I will definitely be sharing another great Secret Recipe Club recipe.